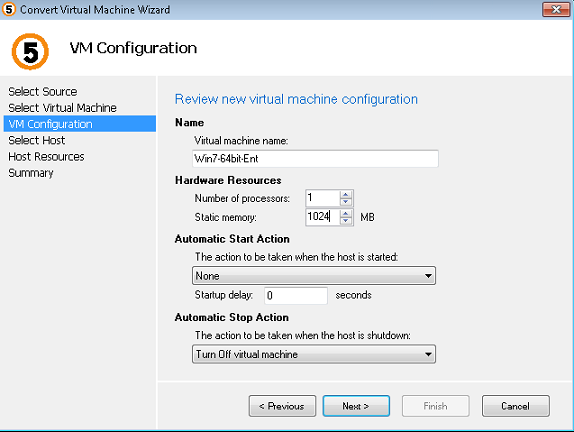 In this article, we will show you how to use another free tool that allows the migration of Virtual Machines from vSphere to Hyper-V using the free 5Nine V2V Easy Converter. Before I show you HOW to perform a V2V (vSphere to Hyper-V), let’s first answer the WHY question. Why would you want to move from vSphere to Hyper-V? Testing Hyper-V – let’s say that you want to prove that an application runs just as well (or even as poorly) on Hyper-V as it does vSphere. You could do a V2V and try it out. 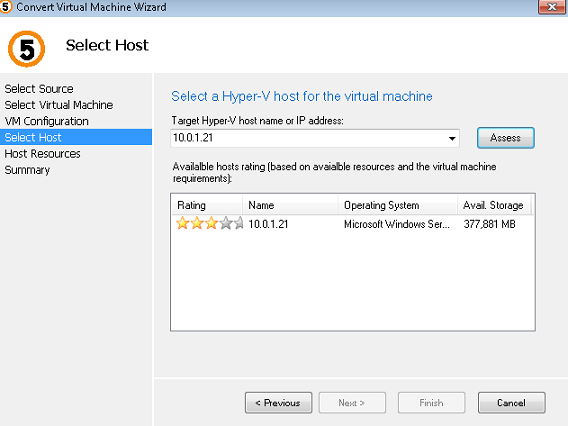 You could also just test out Hyper-V, if you haven’t used it before, with an existing VMware vSphere VM. Conversion – when a company is bought, sold, or consolidated, there are always scenarios where you would want to move from one platform to another. Bonus reason: “because you want to”. Everyone should have the freedom and ease of moving a VM from one platform to another. After all, that is one of the things that virtualization first enabled – hardware independence, portability, freedom, and choice in your hardware – you should also have that in your virtualization option. 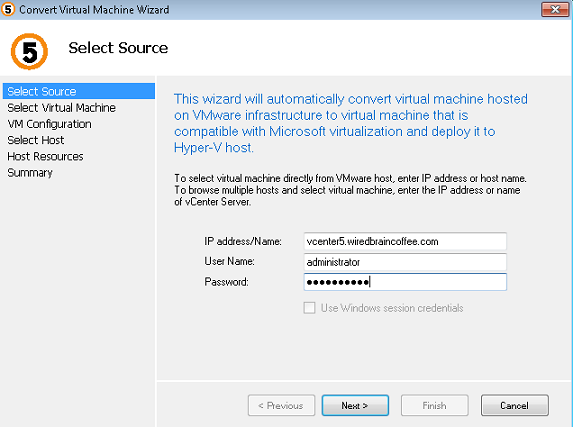 Recently, I came across a new V2V tool for going from vSphere to Hyper-V, currently in a beta preview mode. V2V Easy Converter from 5Nine is free (at least the beta preview is), simple to use, tiny to download, fast to install, and it works. Here’s what I did. I downloaded V2V Easy Converter (which didn’t take long as it is under 2MB). It was the typical Windows install, only a little shorter because it is so small. No matter what V2V application you use, this is the general process that happens in the background. To get started with this V2V conversion using our tool, I ran the icon in the Windows start menu called 5Nine EasyConverter. When the converter comes up, it shows you a series of blanks for you to fill out, across a few screens, in easy wizard-format. It starts with the selection of the source. 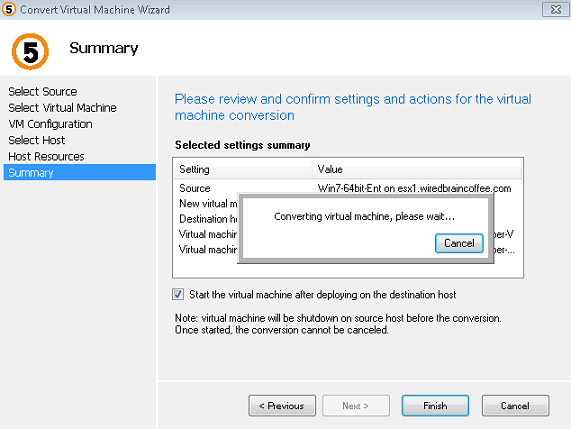 In other words, what ESXi server or vCenter server will we contact to find the virtual machine that you want to convert? It scanned the vCenter server I specified and then gave me a list of the VMs I could convert. 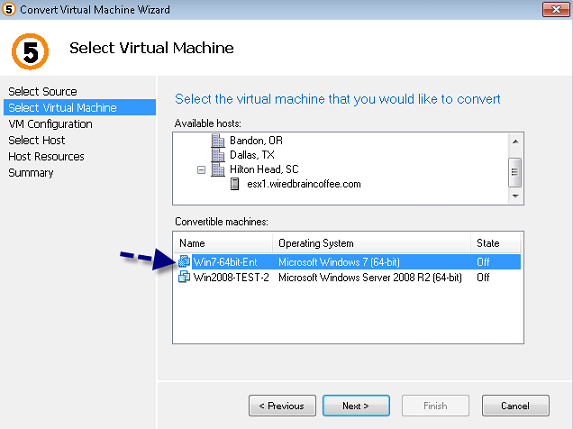 Note that, today, these VMs must be Windows 2008 or Windows 7 (or newer) VMs and that they must be powered off. Later, it will be supported to convert older operating systems and, perhaps, powered on VMs. 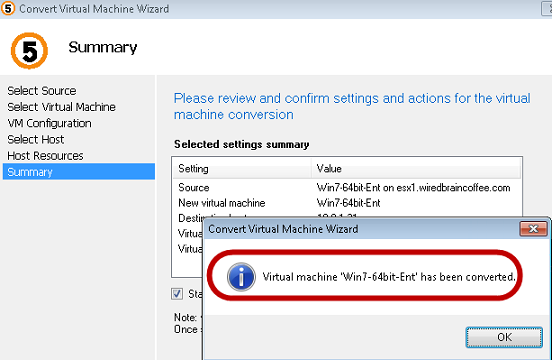 I selected the VM I wanted to convert, gave the new VM a name, and specified the hardware resources it will consume over on the Hyper-V server I was moving it to. Next, I entered the name of my Hyper-V server and used the “assess” option to see if it was a suitable host for the VM that I want to convert there. 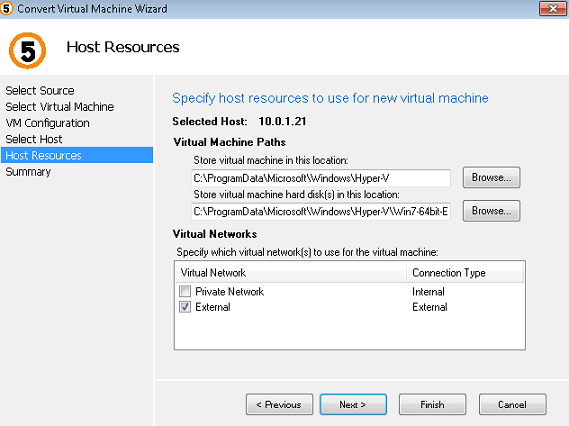 From there, I took the defaults for the VM paths on the Hyper-V server and selected what virtual networks this new VM would have access to. Next, I reviewed a final summary of what was about to happen and opted to power on the VM once it was converted. After clicking Finish, the VM started its conversion. Being as this VM has a 200GB thinly provisioned virtual disk (that only had 11GB in use), I was curious to see how long this would take and exactly what would happen. It took a while (on my slow lab network) but I saw that the virtual machine had been converted (as in Figure 7, below). Over in the Hyper-V Manager, I could see that a new VM had been converted and I could even see the size of the VM’s virtual disk had 12GB in use of the maximum 200GB virtual disk (almost identical to the original). 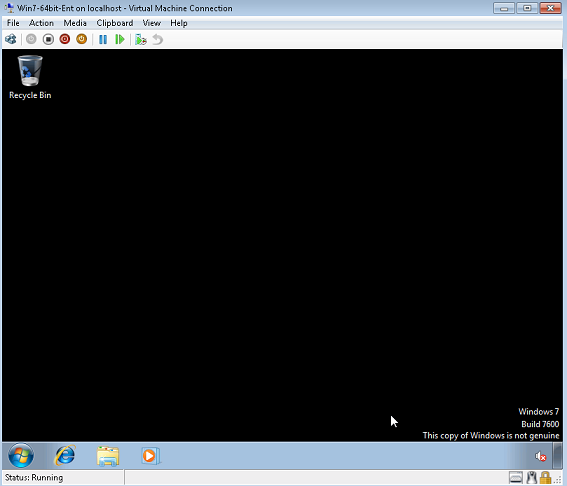 I can even access the console of the converted VM to prove that it worked. At this point, our conversion from vSphere to Hyper-V is done! What did we learn through this V2V process? There are a number of reasons you would want to convert VMs from vSphere to Hyper-V and you should have an easy option to do so if you choose (freedom of choice, just like in a free market economy). Reasons include testing, learning, and consolidation of production VMs. Freedom of choice in virtualization platforms is made easy when VMs can be easily moved from one platform to another, just as you would choose one restaurant over another if you were dissatisfied or to test the competition. Thanks to tools like EasyConverter, you have a free and easy option to move VMs from vSphere to Hyper-V if you choose to do so. Note:I am a huge proponent of VMware vSphere so I am not recommending that everyone move, simply that you have the option to do so if you want, just as you have the option to easily move from Hyper-V to vSphere using VMware Converter.